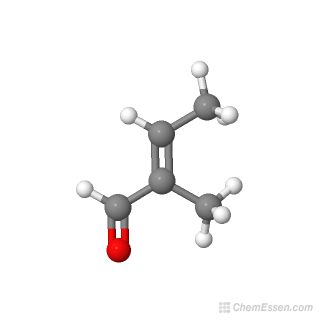 The structure data file (SDF/MOL File) of Tiglic aldehyde is available for download. Click the link below to start downloading. The structure data file (SDF/MOL File) contains the information about the atoms, bonds, connectivity and coordinates of Tiglic aldehyde molecule. It starts with a header block, followed by "connection table’, which describes the structural relationships and properties of the atoms. The structure data file (SDF/MOL File) available above can be imported to most of the chemistry-related software packages, performing further scientific analysis. Most of the computational software and visualization program require the structural information of the target molecule, and the above structure data file (SDF/MOL File) can be a good option. By visualizing the structure data file (SDF/MOL File) above, the chemical structure image of Tiglic aldehyde is available in chemical structure page of Tiglic aldehyde, which specifies the molecular geometry, i.e., the spatial arrangement of atoms and the chemical bonds that hold the atoms together. The molecular weight of Tiglic aldehyde is available in molecular weight page of Tiglic aldehyde, which is calculated as the sum of the atomic masses of each constituent element multiplied by the number of atoms of that element. The chemical formula of Tiglic aldehyde is given in chemical formula page of Tiglic aldehyde, which identifies each constituent element by its chemical symbol and indicates the proportionate number of atoms of each element. It can provide a standard way to encode the molecular information of Tiglic aldehyde to facilitate the search for the compound information in databases and on the web. The InChIKey may allow easier web searches for Tiglic aldehyde, but it needs to be linked to the full InChI to get back to the original structure of the Tiglic aldehyde since the full standard InChI cannot be reconstructed from the InChIKey. Visit ChemTopia for further professional chemical information on the basis of a comprehensive intelligence networking platform for experts in the discipline around the globe. Need to identify active compounds in your natural products? Then, try SnaPeaks – simply upload your MS/MS data and SnaPeaks will provide what’s in your natural products. Conversion of complicated chemical-related units is no longer sophisticated with the aid of UnitPot. UnitPot is a noteworthy web-based scientific unit converter that comes with an intuitive user interface. What’s the Tiglic aldehyde formula? How many atoms and what elements are included in the Tiglic aldehyde molecule? How many chemical bonds and what kind of bonds are in the Tiglic aldehyde structure? What’s the Tiglic aldehyde’s molar mass? What’s the SMILES structure of Tiglic aldehyde? What’s the InChI code of Tiglic aldehyde? 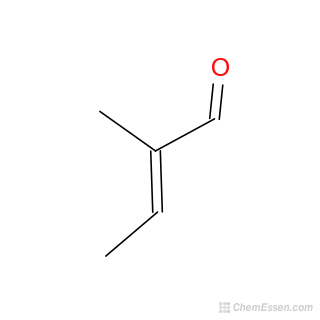 What’s the InChIKey format of Tiglic aldehyde? Source: Mol-Instincts Chemical Database, Predicted on Quantum. Please hyperlink "Mol-Instincts" to www.molinstincts.com.